Review of Richard Bonney, ed. and trans., Confronting the Nazi War on Christianity: The Kulturkampf Newsletters, 1936-1939. Studies in the History of Religious and Political Pluralism, Vol. 4 (Oxford: Peter Lang, 2009), 578 pp. ISBN 978-3-03911-904-2. This volume presents a fascinating primary source on church-state relations in National Socialist Germany from the remilitarization of the Rhineland in early 1936 to the eve of World War II. 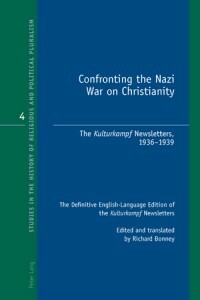 The full title of the newsletters collected here was “Kulturkampf: News Bulletin of the Religious Policy of the Third Reich.” As Bonney explains in his introduction, these newsletters were published in London in English by the Kulturkampf Association, also known as the League for the Defence of Christianity, with funds from Erwin Kraft and encouragement from Bishop George Bell. Bonney estimates a circulation of about 2,500 copies. The English edition was translated from a French original, the work of German Catholic exiles in France. Karl Spiecker, a former chief of the German press service, was the editor. No doubt his experience was key in giving the bulletin its professional quality. Some of the newsletters have already been published in German, edited by the distinguished church historian Heinz Hürten: ‘Kurturkampf, Berichte aus dem Dritten Reich, Paris’. Eine Auswahl aus den deutschsprachigen Jahrgängen 1936-1939 (Regensburg: F. Pustet, 1988). Bonney’s book now makes this material available in English, along with some portions that Hürten did not include. The newsletters are remarkable in their depth of coverage and analytical sophistication. Spiecker and his contributors, none of whom are identified, were surprisingly well informed on everything from international affairs to local developments. They devote what comes to almost 150 pages in the book to the Anschluß of Austria and its ramifications for the churches yet also note the significance of quotidian matters, such as the July 1938 attempt by a German merchant to “Aryanize” his daughter’s name, Judith, by lopping off the “h.” Consideration at three levels of courts left the outcome uncertain (416-7). Many of the newsletters reproduce passages, some of them extensive, from Nazi speeches and publications: Der Stürmer and Das Schwarze Korps, but also others that are no longer well known. Readers interested in any aspect of life in Nazi Germany in its understudied “middle period” are certain to find pertinent tidbits and possibly even major insights here. The broad outline of the position presented in the newsletters is fairly predictable. 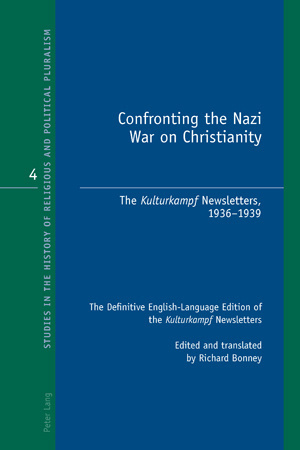 Informed readers will be able to anticipate the central claims already from the titles – of Bonney’s volume, with its reference to the “Nazi War on Christianity” and of the newsletter, with its invocation of Bismarck’s Kulturkampf. The newsletters depict National Socialism as an ideological, institutional, and moral assault on Christianity that evolved from crude frontal attacks led by pagans and neo-pagans to a much more dangerous scheme to create a nazified, national church. For the people who assembled and distributed the bulletins, what must have been incredibly difficult and also risky work held out the promise of rallying forces beyond Germany in support of the churches, in particular the Roman Catholic Church and its most beleaguered elements. For Bonney, publishing this material now is a way to pay tribute to clergy who did not give in to Nazism (the book, like the German edition of Raul Hilberg’s Täter, Opfer, Zuschauer, is dedicated to Bernard Lichtenberg). It also appears to be a response to Richard Steigmann-Gall’s “revisionist position” (23), to which Bonney refers at numerous points. Like every rich primary source, the Kulturkampf newsletters also contain surprises. The authors demonstrate an impressive grasp of the complex and dynamic connections between Nazi treatment of the churches and Hitler’s foreign policy. They devote a significant amount of space and understanding to developments within German Protestantism and to fostering a spirit of Christian solidarity. Rather than preaching the now familiar contention that the Roman Catholic hierarchy, led by an anti-CommunistVatican, settled for Hitler as the “lesser of two evils,” the newsletters explicitly reject that view. National Socialism was totalitarian, they insist, and as an ideologically conceived religion or substitute for religion, it posed an absolute and mortal threat with which there could be no compromise. The authors of the newsletters clearly recognized the centrality of antisemitism to the Nazi program, but in their analyses, the persecution of Jews is always a point of departure for discussion of the position of institutionalized Christianity. Most telling perhaps is the lengthy coverage of Hitler’s infamous speech of January 30, 1939, in which he “prophesied” that the next world war would result in the annihilation of Jewry. That part of Hitler’s tirade goes unremarked here, as the newsletters focus on another threat he made: that continued “misbehaviour” on the part of the churches would result in complete separation of church and state in Germany (488). The usefulness of Bonney’s volume is unfortunately limited by the brevity of the introduction – much more could have been done to explain exactly what the newsletters were and how they were produced and received – and the paucity and unevenness of the footnotes. Nevertheless, this is a valuable contribution that provides much to ponder for all students of National Socialism.